Travel back in time to Cornwall where the burdens of England’s two wars and a hardscrabble life for many of her citizens finds smuggling to avoid taxation, theft and morally questionable acts are all that come between many families and starvation. Jenna Cartwright is the youngest child in her notorious family, raised with thieving, smuggling and learning her parent’s craft. At four or five, she has already lost two older brothers to jail, and the third child has eschewed the family trade to seek his own life at sea, leaving his sister, younger brother and parents behind. Starting with a glimpse at Jenna’s first strong memory, we see the child hiding quietly and trying to stay unnoticed from the thief takers (think bounty hunters) as they have come for her parents. She’s discovered but left behind after a thorough scaring: and soon her only remaining family member, her brother Silas, comes to comfort her. Jack Penhale is a thief-taker, one of the best in the business. He’s first encountered Jenna as she’s running from assisting her husband’s death during a hanging, to the anger and dismay of the crowd. Now without a home or support, she’s gone to the Mop Faire, hoping to find employment. While Jack isn’t interested in having anyone in his home, he finds himself with a housekeeper, one that he’s intrigued by far more than he should be. What follows is layered, complex and completely organic in feel. Jenna is nothing like her family, and has worked incredibly hard to overcome the name she was born to, going so far as to marry the first who showed interest: a horrible man who was as free with his fists. She’s only got her brother Silas as family, he’s now in debtor’s prison and consistently abusing her trust and caring for him with lies, schemes and more lies. Jack is determined to discover just who is running the smugglers in the area, he’s been brought in by a local man with political connections and ambitions to achieve that goal. But, he’s still not told Jenna of his work, and she’s not shared her life in it’s entirety with him. Both have plenty of secrets they keep, but his treatment of Jenna: teaching her to read, providing her safe haven, even treating her as an equal and with respect is like nothing she’s ever encountered, and feelings are growing. Despite his determination to not need anyone, or anything, Jack’s desire for and attraction to Jenna, the person she is: loyalties and curiosity included, have him battling his own secretive nature and worries that if she knew what he was doing, she’d be in danger, or share her knowledge with those who can’t be trusted. Victoria Cornwall brings the place, time and these characters to life: while you understand Jack’s quandaries: understanding that people are starving and the smuggling puts a few meager pennies into their pockets; pennies that could mean the difference between existence and starving, his determination to root out the ringleaders and end the terrorizing of merchants and townsfolk from the smugglers is one that he clearly struggles with. Not everything, for him, is black and white after Jenna appears in his life: he’s seeing the greys and having a difficult time balancing the crimes and punishments wth his own personal prejudices. For her part, Jenna has never been able to rely on any but family, and even knowing that Silas is more prone to lie than truth, she can’t overcome the doubts and questions that he places in her mind: still thinking as the little girl with only her brother to protect her. When you add the writing and the complexity of life experience, desires for more and the reality of the secrets held far too long, the story builds into clear pictures as you read on, wishing that things work out even as you believe they just may not. Corruption, larceny, tension and moments of heat where the connection between Jack and Jenna sparks into flame, the story unfolds in a way that demands attention and keeps giving more. I can’t wait to see where the next book leads, as I’m ready to go back to see the changes and progress as time marches on. Following a fulfilling twenty-five year career as a nurse, a change in profession finally allowed her the time to write. Since then, Victoria’s writing has been shortlisted for the New Talent Award at the Festival of Romantic Fiction and twice nominated for the RONÉ “Best Indie or Small Published book” Award. 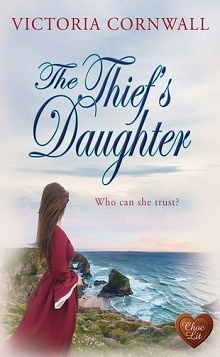 In 2017, her novel, The Thief’s Daughter, was a finalist for the Romantic Novelists’ Association’s Joan Hessayon Award.